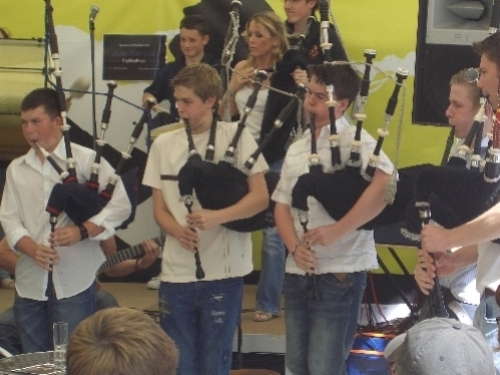 THE 98 HIGHLANDERS (PM Ian Duncan) - Photos of us piping at the Launch of Gordon Duncan's 4th C.D. 'Just for Gordon' and 'Gordon Duncan's Tunes'. This was a very special day! Pipe Major Ian Duncan, Gordon's brother, released Gordon's 4th c.d. 'Just for Gordon' as well as 'Gordon Duncan's Tunes', a book of Gordon's compositions. 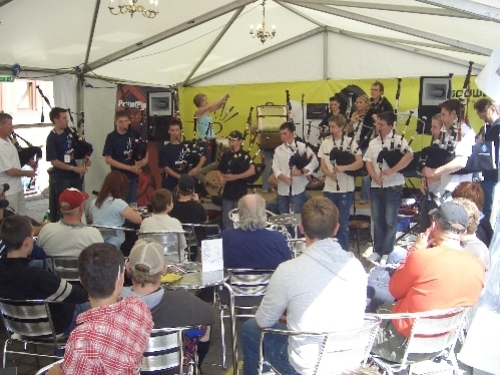 This was held at the National Piping Centre in Glasgow during the 'Piping Live' Festival in August 2007, in memory of Gordon, who passed away in December 2005. The 98 Highlanders Pipes and Drums was honoured to play at the launch of Gordon's book and c.d. 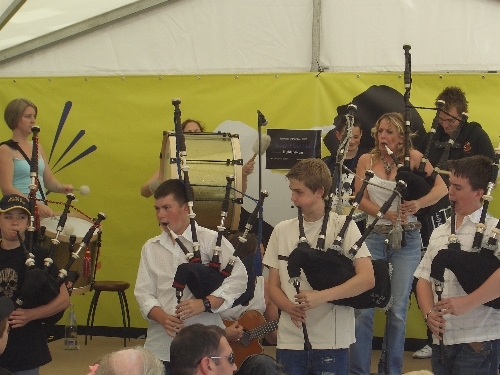 Amazingly, Ian managed to sift through the music archives searching for recordings of Gordon's outstanding piping performances, including radio broadcasts, competitions and concerts at home and abroad and the result is the 'Just for Gordon' c.d..
All proceeds from 'Gordon Duncan's Tunes' as well as the c.d. 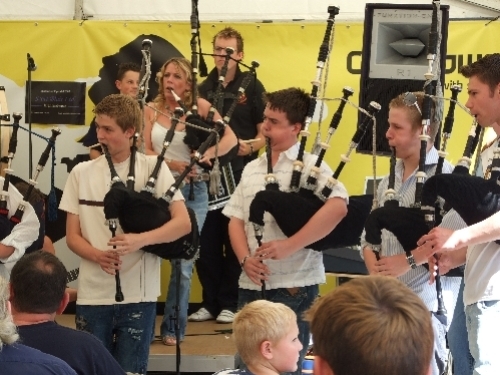 will go towards the 'Gordon Duncan Memorial Trust', which has been formed to 'raise funds for the promotion of piping and other forms of traditional music amongst young people in Scotland'. Please log on to www.gordonduncan.co.uk for more information on the trust fund. The 98 Highlanders playing for Gordon! It was an honour to take part! Playing a selection of Gordon's tunes. 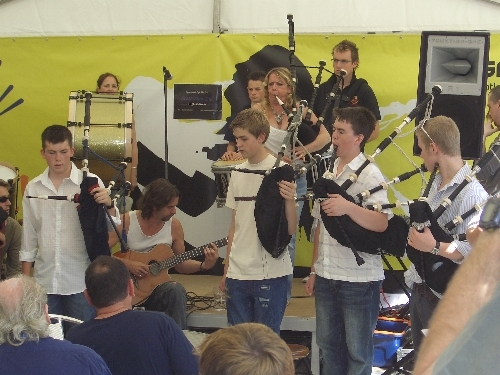 All the 98 Highlanders in Action! It was a beautiful summer's day! 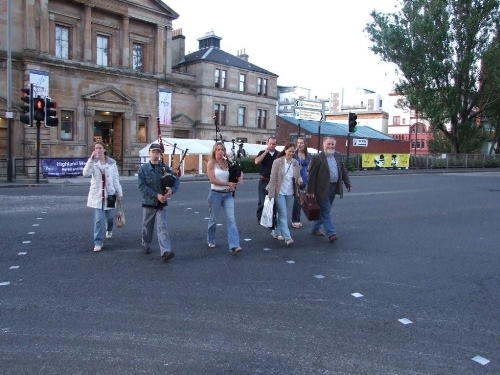 Alex, Gordon Duncan's nephew, and me piping from the Piping Centre to the pub after the launch!! Along with Chris, Christina and the Gang! Time to have a wee refreshment!!. Pipe Major Ian Duncan and Me having a wee tune in the pub, amongst the many other musicians having a tune and a drink for Gordon!! Playing 'The Little Cascade' - not a good choice of tune after having a pint or two! !